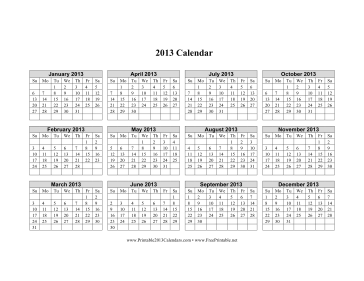 All 12 months of the year 2013 are displayed on one page on this horizontally oriented, letter-sized calendar that is on a grid so each date has its own box. The months are in descending order. Free to download and print. If you don't see a calendar design or category that you want, please take a moment to let us know what you are looking for. Read a note from Kevin.